Trois niveaux de vie; 2 chambres plus une mezzanine. 3 salles de bain complètes. Recommandé pour 4-6 adultes. Cette cabane est entièrement meublé et accessoirisé et est livré avec tous les conforts de la maison. Tout ce que vous devez apporter votre valise. Un foyer au bois et écologique géothermique chauffage / refroidissement en font une cabine très confortable, hiver et été. L'espace bien-être à l'étage principal comprend un sauna infrarouge personnel, chaise de massage professionnel et d'un jacuzzi pour deux. Internet haut débit et le téléphone sont inclus. Il ya six terrains de golf (de débutant à expert) dans le voisinage immédiat de cette cabine: Trickle Creek, Boot Leg Gap, Kimberley terrain de golf, de montagne Ombre, St. Eugene Mission et Way-Lyn. 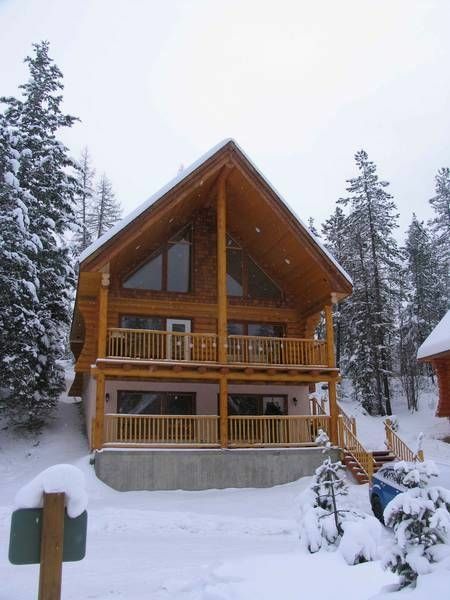 Le chalet est situé à seulement 17 km de l'aéroport international (Cranbrook); vous pouvez faire du ski ou de golf en moins d'une heure d'arrivée! La station de Kimberley de ski offre ski excellente descente et cross-country, traîneau à chiens et en raquettes à neige occasions pendant les mois d'hiver, ainsi que le rafting, le kayak, la pêche, la randonnée pédestre (dans le parc naturel voisin), un centre d'escalade et le VTT possibilités, outre le golf, au cours de toutes les autres saisons. My family had a great stay. The house was well stocked. My kids loved being able to each have there own space. My husband and two girls had a great stay at Erika's cabin in Kimberly. The cabin was clean and well stocked with everything we needed! The location was very quiet and ideal for hiking/snow shoeing some amazing trails right outside the front door with a short walk up the street to the trail heads. The ski hill is about 15 minutes away. It's an easy drive. We loved coming back to a real fire where we could cozy up with our books or play some games. We definitely hope to book this cabin again. We love Kimberly and we will be back. Thanks Nicole for the lovely write-up. It is our preferred home-away-from-home too. Love to have you back and enjoying the cabin! Awesome accommodations for our grown up family of four! Beautiful site and hiking 5 min. away. We loved the use of the kitchen and bbq as well as fireplace after skiing. The three full baths were great so that our 20 year olds could have their own level for sleeping with bathroom of their own. It was clean and new. It advertised a massage chair and three person hot tub, one person electric sauna. The chair is still not working, and should be taken off the ad. The house doesn't have enough capacity in the hot water tank to fill the tub above the jets. Otherwise we loved the quiet location, 15 min to skiing. Property was exceedingly clean and well maintained. We liked the fact that some basic cooking essentials and condiments were in the cupboard and fridge. The owner was somewhat concerned about the effect of the wildfire smoke on us but it worked out fine. Apparently the air quality at our home in Alberta was actually worse than that in Kimberley. It was a great place for two couples and close to the golf courses we were interested in playing. Thank you Erica. Thank you, Brian and company. I am happy you enjoyed your stay and the extras you 'found' in the cabin. I was indeed worried about the smoke reaching the cabin and am relieved to hear that it was not effecting your vacation. Thank you for booking with us! Had a beautiful stay with nice neighbours and daily visits of some deers, fantastic weather. It was just a perfect stay. We have been to Kimberley many times but never stayed off the hill. This home was lovely and we really enjoyed the location. Although a little off the beaten path, it was 15 minutes from the ski hill and 10 minutes from the Platzl. The massage chair wasn't working at the time we were there, which was a bit of a disappointment as our muscles were sore after skiing. We used the sauna and the jacuzzi and both were nice. We did have to purchase shampoo/conditioner and some toilet paper. I believe that the guests previous to us probably did not tell the owner that there wasn't any toilet paper left, as she specifically asks guests to inform her if supplies are low. And I made assumption that toiletries like shampoo would be supplied, but I should have asked before making that assumption. All in all, this was a nice place and we would rent it again. I think it would be a spectacular summer rental as the location is right next to the Kimberley Nature Park and very close to some great golf courses. Damage to the property or contents must be reported in writing and this information must be left on the kitchen counter for the cleaning crew. This is a courtesy request so that we can replenish or replace items broken or damaged for the next renter.